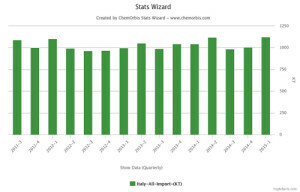 During the first quarter of 2015, Italy’s overall polymer imports reached their highest level since the third quarter of 2011. The quarterly gain in imports were attributed to overall supply tightness, especially for PP and PE, which have been impacting the markets since February, according to ChemOrbis. Italy’s total polymers imports rose by 8% year on year in the first quarter of 2015 to exceed 1.1 million tons. On a product by product basis, Italy’s homo-PP imports edged down by around 2% year on year in the first quarter, but still suggest a gain of around 13% compared with the previous quarter. Germany was Italy’s top homo-PP supplier, with the country’s exports exceeding 50,000 tons in Q1, followed by France and Saudi Arabia. For PP copolymer, imports surged by over 20% year on year in the first quarter, with Belgium ranking as the top PP copolymer exporter to Italy with over 30,000 tons. When compared to the last quarter of 2014, imports are up by 17.2%. Italy’s LDPE imports were also up by 6% year on year in the first quarter of 2015. The top three exporters, France, Belgium and the Netherlands, were unchanged. Imports of LDPE posted a larger gain of around 17% on a quarterly basis. Imports for LLDPE were up by 15.7% compared with the first quarter of 2014 and exceeded 60,000 tons. The top three LLDPE exporters to Italy were France, Belgium and Germany. LLDPE imports also edged up by 6% compared with the previous quarter. Imports also rose by 6.6% year on year for HDPE. Germany remained the top HDPE supplier to Italy in the first quarter, followed by Saudi Arabia. Despite the gains in imports of PP and PE, PVC imports remained unchanged on an annual basis at around 160,000 tons. When compared to the last quarter of 2014, however, PVC imports were up by 12.4%. The top exporter was France, accounting for over 40% of Italy’s overall PVC imports. PS imports edged up around 4.4% year on year in the first quarter. France was the top PS supplier to Italy, followed by Germany. Compared to the previous quarter, PS imports rose by over 6%. Italy’s PET bottle imports also climbed by 10% on an annual basis in the first quarter. South Korea was the top PET bottle supplier to Italy with over 25,000 tons, followed by Indonesia with around 16,000 tons. 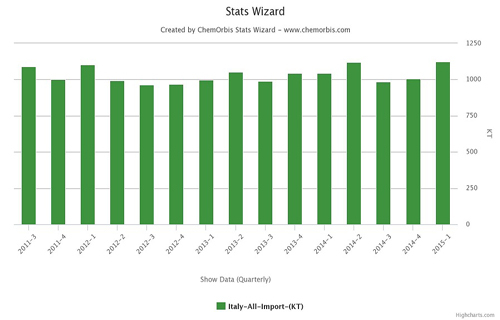 France ranked as the top polymer exporter to Italy in the first quarter of 2015, accounting for around 19% of overall imports, followed by Germany and Belgium, according to ChemOrbis.